This important book addresses the objects and reasons for fear, the rule and various kinds of fear, the true character of the fear of God, the effects of godly fear, the privileges of those who fear God, and the uses of this doctrine. This work contains an introduction, outline of the book, and a study guide at the end for personal or group study. - Publisher John Bunyan is the author fo Pilgrim's Progress, which is the most widely read and published book in the world, next to the Bible itself. But he wrote and preached much more than that; his collected works take up 3 large volumes. One of his finest works is this Treatise On The Fear Of God, first published in 1679. This edition has been completely retypeset for easier reading, and includes an outline and study guide. 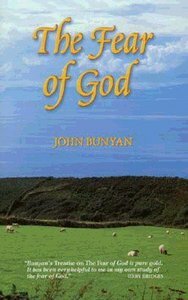 About "Fear of God (With Study Guide)"
John Bunyan is the author fo Pilgrim's Progress, which is the most widely read and published book in the world, next to the Bible itself. But he wrote and preached much more than that; his collected works take up 3 large volumes. One of his finest works is this Treatise On The Fear Of God, first published in 1679. This edition has been completely retypeset for easier reading, and includes an outline and study guide.